First, developers can retain puzzles while making it less likely that the player will become stuck. In recent years, I suspect puzzles have become easier. While my sample size is limited1, and the situation is muddied by the fact that I’m better at solving puzzles than I was as a child, the genre has generally become more player-friendly over the years2. Easier, or at least more reasonable, puzzles would be consistent with that trend. Alternately, developers can provide in-game hints, or offer multiple solutions to each puzzle, as in Stacking. This reduces the odds that the player will become stuck, while increasing replayability: with the player free to move on, searching for alternate puzzle solutions can become a challenge rather than a chore. 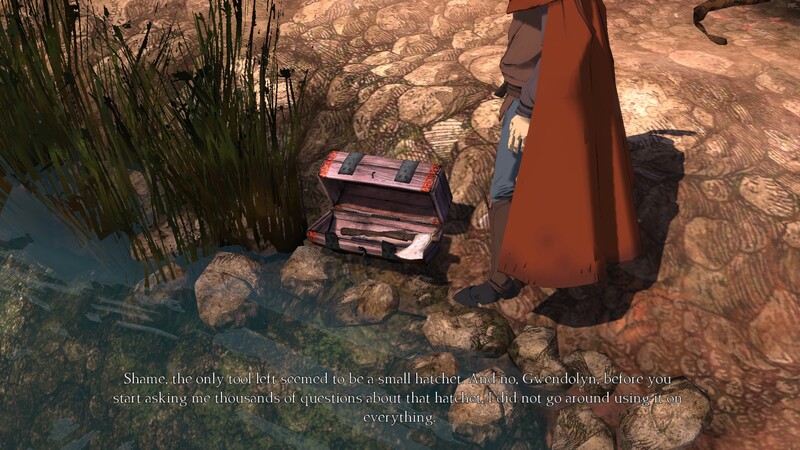 The second route is to move away from puzzles — and, in the process, redefine the adventure game. Examples include Telltale’s Tales from the Borderlands3, where the player’s choices revolve around (1) QTEs and (2) telling one’s own story using mutually exclusive dialogue options. Finally, developers can move away from inventory puzzles towards challenges that better reflect the game’s theme. The most interesting, ambitious example I’ve seen is Sherlock Holmes: Crimes & Punishment, where at the end of every case, it is up to the player to form his or her own conclusions as to the true version of events. Who was the murderer? What was the murder weapon? Can I trust what the drunken witness said? In-universe, this is what Holmes must decide, and so it makes sense for the player to step into his shoes. A sort of halfway example can be seen in the Phoenix Wright games, where Phoenix debunks NPC testimony by presenting the right piece of evidence at the right time. Mechanically, this is pretty much an inventory puzzle, right down to the aggravating “how can that not be the solution? !” moments when player and developer logic don’t line up. Thematically, it still makes more sense than forcing Phoenix to combine item A with item B. As a final disclaimer, I should note that I have a patchy knowledge of modern adventure games — I’ve only gradually drifted back into the genre over the last few years. I still need to finish the first episode of King’s Quest. I haven’t played Life is Strange or Wadjet Eye’s indie catalogue, I’m two episodes behind in Tales from the Borderlands, and I’ve only scratched the surface of The Book of Unwritten Tales. My Kickstarter copy of Dreamfall: Chapters is waiting for me to replay The Longest Journey (and fish Dreamfall out of my Steam backlog). Still, I like what I see. Adventure games are delivering what I’ve always enjoyed about them (story, characters, dialogue) as well as new spins on traditional mechanics. I look forward to rediscovering the genre! The adventure game genre is recognisable, but also arguably outdated. I recognise it because a game like Return to Zork aggravated me, and to this day, I know better than to cut the bonding plant at the start of the game, or to let the mice bite me amongst other traps in the game. The modern adventure game though, taking your initial definition into account, I believe is a term that encapsulates many more games. The joys of PC hardware becoming better, open world games offering horizons to travel toward and richer areas to explore. Prince of Persia (2008) is the first example I would offer. The puzzle elements are weak and rely on a knowledge of platforming in order to determine how to get to point Z from point A, but it is rich in story and setting as far as I am concerned. I’m not immediately familiar with Uncharted series, but I suspect it is very much an adventure game. The genre has evolved quite a bit over the years, and that is all for the best. To this day, I know it is better to dig out a bonding plant, as opposed to cutting it off at the stem, and not to handle mice because they carry disease. Thank you Return to Zork! Perhaps you could draw games on a spectrum that goes pure adventure, no reflexes < ----------> pure action, no puzzle solving. The old adventure games were, say, >90% puzzles but sometimes contained action elements (e.g. the fistfights in Indiana Jones & the Fate of Atlantis). Something like the modern Tomb Raider would probably be the opposite, >90% action with a few puzzles. Zork is one classic series that I never played – how did you find it?